Q: In response to Taiwan's accusation that the Dominican Republic cut off their "diplomatic ties" in exchange for vast cash assistance, President Danilo Medina of the Dominican Republic said that China established diplomatic relations with his country with no strings attached. They were following the trend of the history. The Dominican Republic cannot be expected to forever stay out of a diplomatic relationship with the world's second largest economy. Such a relationship must come into being at one historical point. Besides, the two major opposition parties in the Dominican Republic also publicly voiced their support to the establishment of diplomatic ties between China and their country. They said that the Dominican Republic cannot avoid any longer the reality of China's rise. It is only a matter of time. What is your comment on these statements? A: We have noted these positive statements made by President Medina. 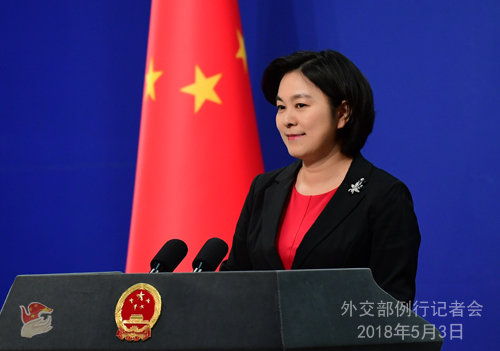 China highly commends the unanimous support of the Dominican Republic's governing and opposition parties and all walks of life to the establishment of diplomatic ties between China and that country. There is only one China in the world. The Government of the People's Republic of China is the only legal government representing the whole of China, and Taiwan is an inalienable part of China's territory. Forty-seven years ago, the one-China principle was incorporated by the UN General Assembly Resolution 2758. Today, it has become a well-recognized principle for international relations and a universal consensus of the international community. The establishment of diplomatic ties between China and the Dominican Republic is another testament to the fact that the one-China principle is the aspiration of the people and the trend of the times. No efforts will succeed in trying to stop the rolling wheels of history. We believe that after the establishment of diplomatic ties, more bilateral cooperation potential will be unleashed, which will bring unprecedented opportunities to the development of the Dominican Republic and tangible interests and benefits to the two peoples. Q: Will State Councilor and Foreign Minister Wang Yi meet with Chairman Kim Jong-un during this visit? If yes, what topics will come up? Could you please talk about the outcomes of this visit? A: State Councilor and Foreign Minister Wang Yi is visiting the DPRK these two days. Yesterday, he held a talk with DPRK Foregin Minister and member of the Political Bureau of the Central Committee of the Workers' Party of Korea Ri Yong Ho. The relevant information has been released. We will release the relevant information about Chairman Kim Jong-un meeting with State Councilor and Foreign Minister Wang Yi in due course. 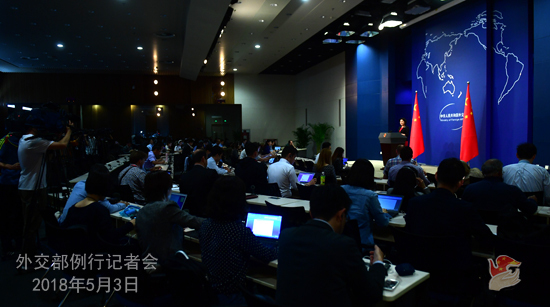 Q: We noticed that the New Zealand China Council published a special report on the Belt and Road Initiative on May 1, describing the initiative as a "project of the century" with great inclusiveness and large coverage that presents enormous opportunities. The bilateral trade and investment between New Zealand and China are of vital importance to New Zealand's lasting prosperity. New Zealand will miss the boat if it does not engage in the Belt and Road cooperation. What is China's comment? A: We have noted the relevant report you mentioned. Since its inception five years ago, the idea and vision of the Belt and Road Initiative have been translated into action and reality, yielding fruitful outcomes and benefiting more and more countries and regions. Up to now over 80 countries and international organizations have inked cooperation agreements with China. According to the data of the relevant Chinese authorities, China has set up 75 overseas trade and economic cooperation zones with countries along the route. From 2013 to 2017, the total imports and exports between China and countries along the route hit 33.2 trillion RMB, registering an annual average growth of 4% , which is higher than the average growth of China's foreign trade over the same period. In the first quarter of this year, the total imports and exports between China and countries along the route grew by 12.9%, with 10.8% growth of exports and 15.7% growth of imports. All this sheds light on the fact that though the Belt and Road Initiative was proposed by China, the opportunities and outcomes it offers are shared by the world. We welcome all countries to get aboard the express train of the Belt and Road Initiative that is bound for a bright future of common development and prosperity. Q: The United States Commission on International Religious Freedom (USCIRF) issued its 2018 report, criticizing China's status of religious freedom. What's your comment? A: The Chinese government protects its citizens' freedom of religious belief in accordance with the law. The Chinese people of all ethnic groups are entitled to full religious freedom under the law. This fact is there for all to see. The so-called commission you mentioned has been politically biased against China all along in disregard of China's progress in the religious field and kept issuing the report to smear China's religious policy and status. Such untrue accusation is not even worth refuting. We advise them to look squarely into and respect the fact, abandon biases and stop issuing such report and using religious issues to interfere in China's internal affairs. Q: Do you expect State Councilor Wang Yi back to Beijing by this evening? If he is not back by this evening, that will be three days in the DPRK, which will make it a very long visit. A: State Councilor Wang Yi is now in the DPRK for the visit. We have released the information that he was in the DPRK yesterday and is there today. Q: According to the US media, China for the first time deployed missile system in the Nansha Islands. Can you confirm that? A: China has indisputable sovereignty over the Nansha Islands and the adjacent waters. 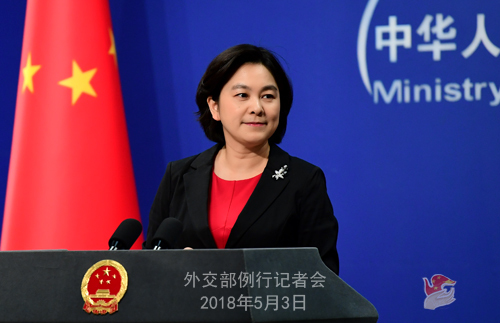 Our peaceful construction activities on the Nansha Islands, including the deployment of necessary national defense facilities, are meant to safeguard China's sovereignty and security, which is also the rights a sovereign state is entitled to. The relevant deployment targets no one. Anyone with no invasive intention will find no reason to worry about this. We hope that the relevant party could view this matter in an objective and calm way. I must stress that China is a big country in terms of trade, and also a staunch champion of regional peace and stability. We will continue to work with all countries to maintain peace and stability in the South China Sea. Q: The US high-level trade delegation starts its visit to China today. Do you have any update on the talks? What is your expectation for the outcome of the negotiations? A: We have said that China welcomes the visit by the US delegation headed by the US President's special envoy and Treasury Secretary Steven Mnuchin to discuss trade issue between the two sides. I have no update for you. As for our expectations, I gave a brief answer yesterday. We welcome talks as long as they are based on equality and mutual respect, the result of which shall be mutually beneficial. Let us all wait and see.